5 Simple Steps for Better Water Efficiency in Cooling Tower Systems | Manufacturers of Cooling Towers & Systems | Delta Cooling Towers, Inc.
Cooling tower systems are some of the most essential parts of any industrial building, manufacturing plant or large office buildings. So what exactly goes into designing an effective and efficient cooling tower, especially when it comes to water efficiency? 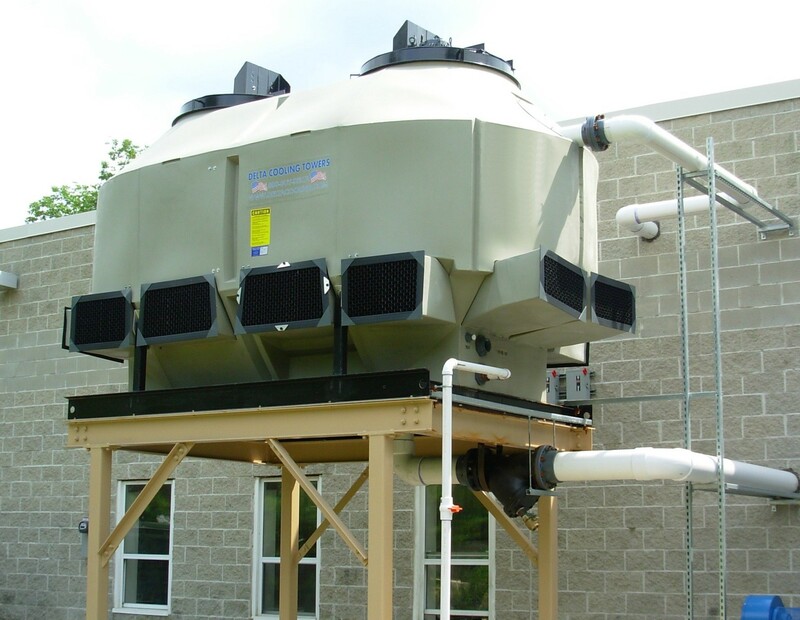 First, it's important to realize one thing: wet cooling towers are going to be more efficient than dry cooling towers in nearly every situation, and there are only a few reasons why businesses choose to install dry towers (usually because they don't have access to water or can't control the cleanliness of the water). Improving water efficiency in cooling tower systems is incredibly important, but if your concern is finding the best way to make sure that your overall efficiency is at the maximum level possible, sticking with wet cooling towers is the right choice. With that out of the way, it's important to focus on two things: the quality of the water in your cooling tower system, and the concentration cycles. When wet cooling towers -- like the ones used by more than thousands of industrial businesses today -- were developed, the goal was to create a system where waste water can be re-used multiple times; good cooling tower manufacturers will provide systems that use up to 98% of recycled water. Keeping the water in your cooling tower system clean is incredibly important; you'll want to calculate how many times water can be re-used before it needs to be cleaned and/or replaced. Typically, owners will bleed-off a small portion of the recirculating water continuously to keep the dissolved solids concentration of the water below a maximum allowable limit. As a result of evaporation, dissolved solids concentration will continually increase without bleed-off. As far as concentration cycles go, most cooling tower systems have cycles ranging from three to seven; it's possible to extend the number of cycles if you monitor water quality closely, but you shouldn't go over the maximum number recommended by the manufacturer. Plastic cooling towers allow higher cycles of concentration than metal towers which are likely to corrode quicker under high cycles. For a specific example: if you double concentration cycles from three to six, you can actually reduce the amount of make-up water by up to 20%. With a 1,000-ton system, you can save about $10,000 per year just by increasing efficiency by 5%, and improving concentration cycles are a great way to start. Last but not least, make sure that you're keeping an eye on problems like corrosion and mineral deposits on the equipment. These factors can cause efficiency to decrease by about 5%, and because they occur slowly over time, many people neglect to fix these issues because they don't seem as detrimental. So now we're turning to our readers for some help! If you've managed a cooling tower system before, what tips would you give to someone else about keeping the system efficient? Or, what questions do you still have about water efficiency in your own cooling towers? We'd love to hear your thoughts!